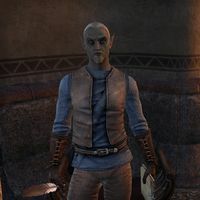 Dinor Salvi is a Dunmer who can be found in the Saint Olms Waistworks in Vivec City. He sits in the hallway just outside the Farmers and Laborers Hall. Culling the Swarm: Kill the excess kwama of Missir-Dadalit Egg Mine and defeat the Queen's Consort. "A word of advice. Never go into the egg mining business." "Are you here about our little … pest problem?" Can you tell me more about the egg mine issue? "Let's keep our voices down, shall we? No need for the whole city to know. I need you to head to the mine as soon as possible and take care of this mess. Just start killing any kwama you see. Particularly the big brute protecting the queen." How did the kwama get to be such a problem? "It didn't seem like a bad idea at the time. What good is a queen without a colony? We sprayed just a smidge of pheromones here and there, and kwama started rushing in! The issue was getting them to stop. We're still working through that one." What happened to the miners? "We had a rather nasty string of kwama warriors begin to fight over the queen's "affections." Took us all by surprise when they started seeing the miners as challengers. Sadly, our standard procedures didn't cover a passion driven battle to the death." Can you tell me more about the kwama warrior guarding the queen? "The miners said he's the biggest kwama they've ever seen, and certainly the nastiest. He's the cause of more worker deaths than the rest of the colony combined. If we're to salvage this situation, he simply cannot remain." "So, are we in the clear?" Your mine should be safe now. "That's good news indeed! You must understand that discretion is paramount here. No need for word to get around of our little mishap. You keep quiet, and I'll see that more work comes your way." "Now we just need to get new miners. Do you know anyone looking for some work?"